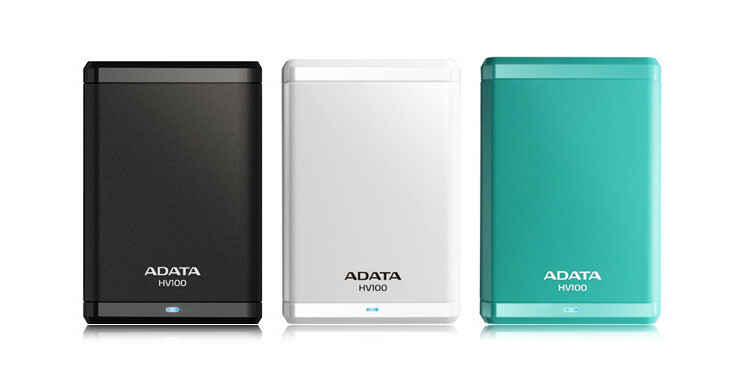 Taipei, Taiwan – November 27, 2014 – ADATA® Technology, a leading manufacturer of high-performance DRAM memory modules and NAND Flash applications, is pleased to announce the arrival of its HV100 External Hard Drive featuring a sandblasted smudge-free finish and a SuperSpeed USB 3.0 interface for ultra-fast file transfers. The HV100 arrives feature-packed with G Shock Sensor Protection to help protect your data, and a bright blue/red LED indicator to show data transfer status. ADATA’s HV100 Hard Drive helps you back up your data locally but provides extra protection, too. If your hard drive suffers a severe shock from being struck, ADATA’s proprietary G Shock Sensor Protection automatically starts up and displays a flashing red light on your HV100 interface. When the shock has passed, a solid or flashing blue light displays indicating normal operation has resumed. While your HV100 Hard Drive comes loaded with the latest super-fast USB 3.0 interface, it’s also USB 2.0 backwards compatible for legacy devices. Buyers of the HV100 also get to enjoy a free copy of HDDtoGO and OStoGO software. HDDtoGO enables one to enjoy true mobility and leave no trace behind when working remotely from your office. OStoGO software allows you install your Windows OS via your external drive. The HV100 is backed by a 3 year warranty. The ADATA HV100 is available in capacities of 500GB, 1TB, and 2TB for the suggested retail price of £44.90, £57.90, and £93.90, respectively, at UK.